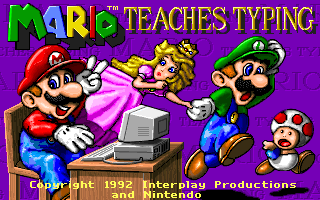 Mario Teaches Typing is a game where Mario attempts to teach you to type, featuring ugly graphics and mediocre renditions of songs from Super Mario World. MCAS.ANI has an early sprite for Mario jumping. He has different shading and his right arm is bent differently. At the beginning of every .RS file is the name "STEVE", followed by copyright. At offset 0x20DE7 in MARIO.EXE is some ASCII art of Mario's head. Mario is voiced by Ronald B. Ruben in the floppy disk version and by Charles Martinet in the CD version. The CD version also adds Mario's giant floating head, which would later appear in Super Mario 64. This page was last modified on 24 May 2016, at 08:40.